In recent years, the demand for the SDD’s has continuously increased and many big hardware manufacturing companies like Samsung, Crucial, SanDisk, have already gone into this market by launching their SSD’s in the storage market and they all have sold well. Now Gigabyte has launched its first UD PRO Series SSD into the storage market, making it the first company to launch the SSD among the four major Taiwanese brand including ASUS, ECS, EVG Aand MSI. 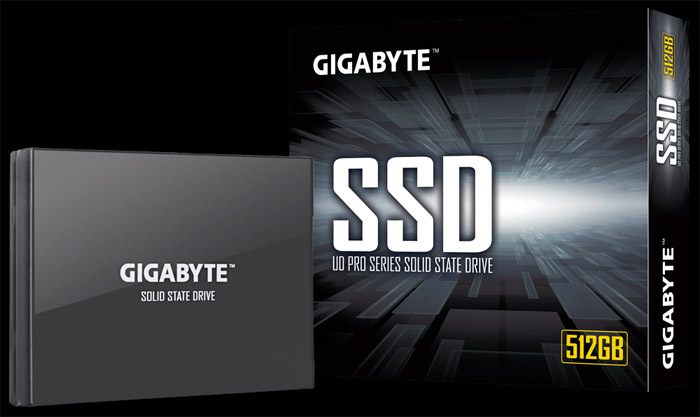 Gigabyte UD PRO series SSD is an entry-level product based SATA interface. There are only two storage variants is currently avaiable, 256GB and 512GB. The UD Pro uses Grouplink’s PS3110-S10 master mix with Toshiba BICS3 3D TLC flash memory. On the below image you can find the specs details of the Gigabyte UD PRO series SSD. Gigabyte UD PRO series SSDs have a continuous read/write speed of 530/500 MB/s, a 256GB random read/write IOPS of 70,000/40,000, and a 512GB random read/write IOPS of 80,000/75,000. The Gigabyte UD PRO series SSD 256GB is priced at US$68.99, while the 512GB version is priced at US$119.99. It is not clear whether this product will be sold domestically. Gigabyte also has plans to bring more SSD in future, including M. 2 NVMe and PCI-E products.